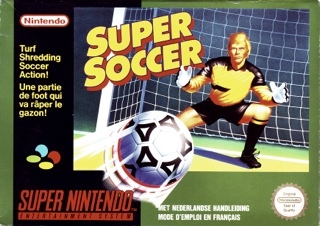 Super Soccer for Super Nintendo allows you to select your team from any of the 16 international squads and hit the field for some intense action as you take on the best the world has to offer. Play in either an Exhibition game or a Tournament, and see if you've got what it takes to rule the pitch and emerge victorious. If the game happens to be tied at the end of regulation, get ready for the ultimate soccer challenge: the shoot-out!